According to the old adage, “Fools breed horses for wise men to buy”, but British sport horse breeding has never been stronger. The quality of horses being bred in Britain at the highest level is now on a par with the rest of Europe. The number of top riders supporting the industry by ‘buying British’ is increasing every year with Charlotte Dujardin and Carl Hester among those doing so. British-bred horses of particular note include Woodlander Farouche, who became the first British-bred to win the World Breeding Dressage Championships. She is now competing successful at prix st george and looks set to go all the way to grand prix. But while our quality of sport horse breeding has undoubtedly improved, there are major welfare concerns regarding the indiscriminate over-breeding of stock at the other end of the market. The number of racehorse being bred has also been a cause for concern, although the throughbred industry has taken action to reduce the number of foals on the ground. 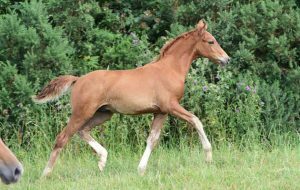 Are you prepared for the arrival of a foal?